Hep-Aid Body Fluid Disposal Kit manufactured by H & S Manufacturing contains the necessary items to clean up a bodily fluid spill when involving urine, feces, blood and especially vomit. The Hep-Aid pathogen kit comes shrink wrapped in a compact size. Complete kit provides efficient, safe and sanitary removal of vomit and other infectious substances. 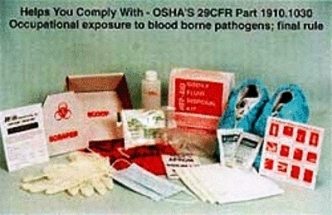 It also comes with safety goggles, face mask, and apron and shoe covers which helps you comply with OSHA's 29CFR Part 1910.1030 Occupational Exposure to Bloodborne Pathogens Final Rule. According to the Center of Disease Control (CDC) recommendations and other studies, after bodily fluid contamination is removed, a 1:10 dilution of 5.25% Sodium Hypochlorite for a contact time of 10 minutes is recommended for clean-up of blood and body spills. The contents and instructions of kit are visible on the outside of the kit for ease of use. Fully compliant with recommendations of: Center of Disease Control (CDC) and the U.S. Department of Health & Human Services (HHS), Occupational Safety & Health Administration (OSHA), Association for Practitioners in Infection Control (APIC), and the Hospital Approved Body Substance Isolation Procedures (BSI). Clean-Up kits are sold by the case and each case contains 12 kits. Discounts apply to case quantities.